Polly want a cracker? Polly doesn’t have teeth yet! Bewilder man and beast alike when you dress up your non-speaking human child as the one speaking animal! Accessorize with your child––it’s the perfect complement to any pirate costume! Your baby may not be ready to perch on your shoulder, but trust us, it’ll get the idea across. There are more than 390 species of parrots, but there’s only one baby parrot: your adorable youngster (perhaps a pygmy genus). They’re known to be highly intelligent by bird standards, and your baby will no doubt prove this to be the case. They’re even able to imitate human voices, usually without understanding the meaning, just like your little one. The most impressive reports of their intelligence are regarded with skepticism. Wait, are we taking about parrots or your baby? While parrots subsist on seeds, fruits and nuts, your baby parrot may need other nutrition. Maybe puréed seeds? Parrots exhibit notoriously little sexual dimorphism––in other words, boys and girls are hard to tell apart. That’s why, in the pursuit of scientific accuracy, this costume has only been produced in a unisex option. The fleece jumpsuit fastens in the back with Velcro and has a handy inseam opening for diaper changes, because nobody likes a poopy parrot. 100 percent polyester means no shrinking. 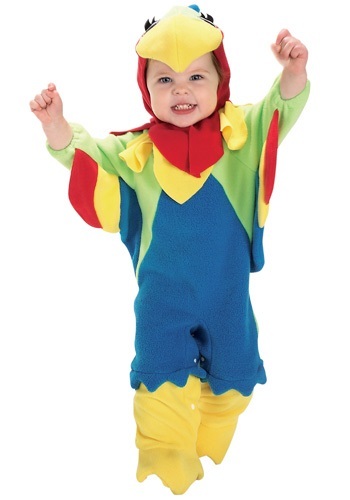 Careful, don’t let your little one get too far––parrots are notoriously difficult to catch. And while affectionate and cute when young, they can become aggressive when they mature. Go figure.